​​​YOUR ACTION CAN EFFECT CHANGE! This is a golden opportunity to have your say and influence the decision makers. WASPI is apolitical and welcome any opportunity to influence policy within all political parties to help right the grave injustice to 1950s women. As the local elections approach it is imperative to establish/maintain contact with your MP, whether supportive or not, and remind them of our ask and how they can help us achieve justice. Phone his/her constituency office for an appointment for a meeting. Do not give up until you have a date. If you are worried about going on your own, see if there is a local group and if they can find you a buddy. Check out our Local Directory for a group near you. Look at the Written Evidence (via link at the bottom of the Home Page) to prepare for the meeting, write a letter (see *Template Letter to MP) with your personal story and with the arguments in MP Factsheet. If you really feel you are unable (for whatever reason) to visit your MP, write or email him/her and insist that s/he answers your letter. Do not give up till you have an answer! INTERGENERATIONAL LETTER TO MPs - Share this letter with the younger members of your family and friends and ask them to show their support for you/the WASPI Campaign. This will help dispel the myth in that the younger generation do not support the older generation and will compound that intergenerational support is very much in evidence. We have produced a MP Factsheet which is easy and cheap for you to print off and hand out to anyone you talk to about WASPI. It contains all the key information and details of how to contact us. Email local news papers/magazines/radio stations and tell your and the WASPI story. Follow up with phone call. Make it hard to be ignored! Ask your local supermarket if they will allow you to be near the entrance (not blocking) handing out leaflets. If possible, ask to have a display or table with info. Invite your local MP and your local press. If there is no Local WASPI group in your area then consider starting one . Email [email protected] for further information. 158 Councils within the UK are showing support for WASPI by passing a motion calling for transitional arrangements. This will put additional pressure on non-supporting MP's and the Government. ​Since the first motion was passed in 2016 the WASPI aim changed to incorporate all women born in the 50s affected by the changes to the SPA and not just those born on or after 6th April 1951. "In 1986 the UK government ratified the UN Convention on the Elimination of all Forms of Discrimination against Women (CEDAW). It gives rights to UK women & obligates government to advance women's lives, recognising past inequalities & remedying them. Its provisions must become part of domestic law". If you’re angry at the way 50's born women have been treated regarding their State Pension don’t complain to us - MAKE YOUR COMPLAINT COUNT and tell the Department for Works and Pensions all about it. If you didn’t get a letter telling you your SPA was increasing tell them, if you would have made different choices had you know you wouldn’t receive your pension at 60 tell them. If you have lost years of your State Pension, tell them. We have a voice. Add yours. There is a Guide to Making a Complaint and template letters to follow below. If ever there was a time to stand up and be counted as a WASPI woman, it is now. If there ever was a time when women needed to help other women in a similar situation as you, waiting up to six extra years for your pension, it is now. 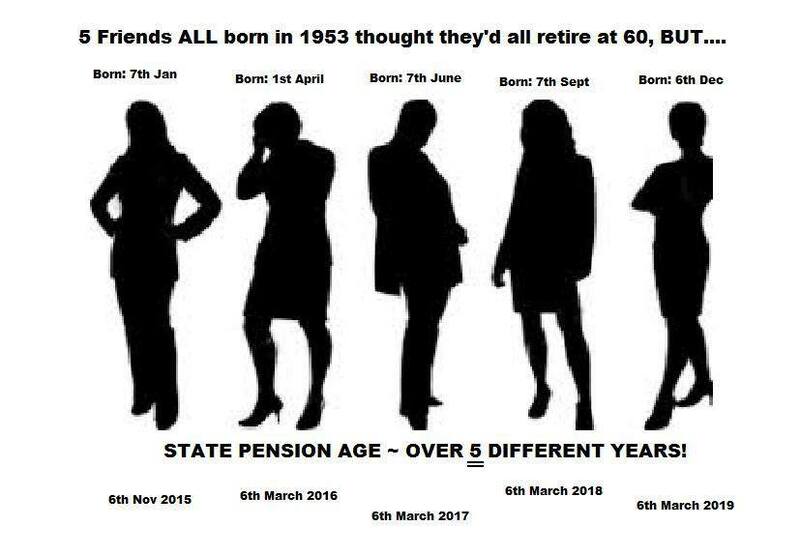 All women born in the 1950s should make a formal complaint about the lack of notice they received about the changes to their State Pension Age. There is no easy way to do this. We must take action and don't wait for someone else to do it for us. We have to turn up the heat and we can all help. Tell your friends; send your letters play YOUR part. We want to cause such a high volume that it will further compel the Government to look in earnest at making remedy for the "grotesque disadvantage" and financial loss we have suffered. ​WASPI have a “​Guide to DWP Complaints". It takes into account all the different issues which affect us. It will ensure that our complaints going to the DWP cover all the necessary points and will move WASPI on to a mass complaint to the Parliamentary Ombudsman, which can help us to get justice. It involves effort, resolve and determination to do it. But if we don’t make that effort we’re sending a strong message to the Government that we don’t have the heart to fight the injustice. As many of us as possible must make a complaint to the DWP - get going on yours now! It must hurt, and it must sting. There are 3.8 million affected by the lack of notice of the 1995 and 2011 Pensions Acts. Not all of them even know its happened. We can help them by making our own complaints and helping others to make theirs. Don’t leave it and think someone else will do it. This is your pension and your fight. Look at the links above where you can get the “ Guide to DWP Complaints ” and template letters which will help you make your complaint. You will also see a Guide to Maladministration which you may also like to read. To make a new complaint use the Stage 1 template letter and send it to the DWP. You are likely to get a reply from the (DWP) saying they will take no further action on your case until after the Judicial Review. This is listed for 5th & 6th June 2019. If you are told this, you do not need to carry on with the complaints process. Just keep the letter until we are able to issue further advice after the Judicial Review. If you are already in the complaints process you should keep sending the template letters until you get a letter stating that your complaint is suspended, closed or no further action will be taken and that there will be no further communication regarding the complaint. It is very important that you keep all letters and documents related to the complaint. If you get a letter from the DWP or Independent Case Examiner (ICE) telling you that the next stage is for you to complain to the Parliamentary and Health Services Ombudsman (PHSO) please don’t do this yet. Once the Judicial Review decision is known it will affect how the PHSO deals with complaints and what the relevant issues are. Complaints that have already gone in to the PHSO may therefore need to be amended once we know more. There is no deadline for complaining to the PHSO so there is nothing to lose by waiting. STAGE 2: Once you’ve had a response to your stage 1 complaint then you’re ready to do your next letter. ​PERSONAL FILE REQUESTS - You can do this as soon as you want. It would be useful to know what DWP holds on your personal file. We would like all WASPI campaigners to ask for this information. You get a form online, print it and complete it - no letter writing this time. You just need to fill in the blanks and post it off to the DWP - simple as that! It takes up to 40 days to get a reply. Women are getting back lots of useful information from the Personal File requests and some are finding it helpful to claim more qualifying NI years as a result. To ask for a copy of the personal information DWP holds about you, please use the DWP request for personal information form. Requests for personal information are also called ‘Subject Access Requests’. The DWP will not charge you for this service. The DWP publishes a document about the service you should receive. If you have a WASPI friend who is struggling with access to the internet, try and double your impact by helping her apply too. Many of you have submitted your complaint letters to ICE and they have not responded. Therefore, it is advisable to give them a 'nudge' ! We have template nudge ICE Letters 1 and 2 available to help you. The second includes a request for the ICE complaints procedure. If you are forced into making a complaint against further service failures because of ICE and the complaint continues to the Parliamentary Ombudsman and the PO finds in your favour - including whatever remedy they think is fitting to you, they fine ICE £5,000.